Nearly everyday, I meet scores of gainfully employed people, not only those who work with my organization, but also from several other companies, self-employed ones, students, doctors, chartered accountants, et al (that is inevitable if you are based in the corporate district of Gurgaon!). And more often than not after such interactions, I am left gasping about the ever-increasing gap between just any working executive or entrepreneur and a real professional. In the mad rush of the working lives we live in, I often find people mistaking every working person to be a professional. How incorrect now that would be? 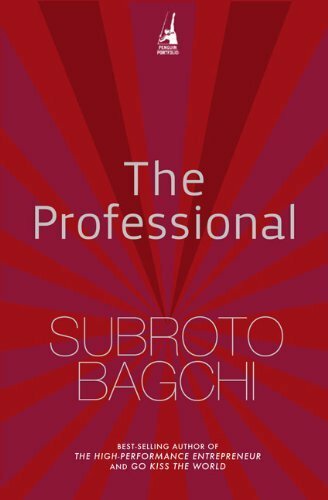 Few years ago, Subroto Bagchi, or Gardener as he is titled and fondly known as, wrote a very compelling book redefining workplace excellence – ‘The Professional’. In many ways, it was a path-breaking work, and in this book, he gave all of us what I call the true meaning of the word ‘Professional’. (Subroto is Chairman and co-founder of Mindtree Ltd.). Here is it: I am quoting from Chapter 2 of the book; pp 3-6. “What are the chances that you work in an entry level position or even a middle level job in a hotel, a hospital, a software company, or a government organization? Or, for that matter, you could be a self-employed professional like a doctor, a lawyer, or a journalist. In all probability you are educated, know English, and are working with (or have interacted with) the corporate sector. Perhaps, an MBA, or a student at an engineering college? You probably consider yourself a professional, or on the road to becoming one. Definitely your station in life is well above someone whose job is to bury unclaimed corpses from city hospitals. I want to introduce the idea of who a professional is through a man whose life is dealing with dead bodies. Unclaimed dead bodies. This is not someone who is conventionally associated with the term professional. His name is Mahadeva. He came to Bangalore as a child when one day his mother simply walked out on her entire village and her own family in a huff. Mother and son lived on the streets; she worked to support him. Until the day she became very unwell. She brought herself and her son to the government-run Victoria Hospital. There she was admitted in a state of delirium and her little son, Mahadeva, made the street outside the hospital his home. He found many playmates among the urchins there and soon that world engulfed him. It was the first time he had had anyone to play with. For little Mahadeva, it was his first experience of kinship and he lost himself completely in this new world. It was pure happenstance that one day someone told him that his mother had died. Where had he been when that happened? The hospital had been unable to wait for him and has disposed of the body. Now Mahadeva had nowhere to go. No family. A few people in the hospital ward where his mother had been admitted raised some money to help him go back to his village. He refused. Instead, he grew up running errands in the hospital. The hanger-on, who had helped with his mother’s admission process and made a living by running errands for patients, asked him to move in with him. He was an old man who had no one either. Mahadeva grew up under his tutelage; the hospital became his universe. And then, one day, the cops asked him to bury an unclaimed body and paid him Rs 200 for the job. This was when Mahadeva entered his profession and eventually became the go-to-guy for burying the city’s unclaimed corpses. Every time police picked up a dead body that had no claimants, Mahadeva was summoned. He had to do a turnkey job: Pull the stiff body in it and take it to a burial ground, dig the ground to bury the dead – all by himself, and for only Rs 200. After doing the job, he would hang around in the hospital to be summoned to dispose of the next unclaimed body. Mahadeva did his work with such dedication, focus, care and concern that soon he was very much in demand. His work grew and he bought his own horse-drawn carriage, and between his horse and himself he was the undertaker to the abandoned. One day, the horse died. People who had watched Mahadeva all these years came together and bought him an auto-rickshaw. The white auto-rickshaw, his hearse, carries the picture of the horse in the memory of the animal who helped him take thousands of people to be laid to rest. It became the logo of his business and appears on his business card today. Mahadeva has buried more than 42,000 corpses in his lifetime and his dedication has earned him phenomenal public recognition. Local petrol pumps do not charge him when his hearse is topped up and the chief minister of Karnataka felicitated him for his selfless service to the abandoned citizens of Bangalore. Mahadeva is proud of his work and his business, and today his son has joined him. Mahadeva: the high performer, and a true professional. What are the two qualities that Mahadeva has which differentiate a professional from someone who is simply professionally qualified? One, is the ability to work unsupervised, and, two, the ability to certify the completion of one’s work. Whenever Mahadeva got a call to reach the morgue, day or night, hail or high water, he arrived. Most of the time, it was a gruesome experience dealing with a dead body; there was no telling what had been the cause of death or state of decomposition. In his business, Mahadeva does not choose his clients. He accepts them in whatever size, shape or state they come. He treats them with respect and care, with due dignity, covering them with a white sheet and placing a garland around their necks before burying them. The day he buried the man who had taken him home after his mother died, he had cried. He was special and Mahadeva had bought a garland as a mark of his respect. That day, it occurred to him that he should be garlanding all the bodies he buried, not just his benefactor’s. Everyone deserves respect and no one should feel ‘unwanted’ in death, even if life had treated them that way. The cops do not supervise Mahadeva. He is not an employee of the hospital; he is the outsourcing agency the hospital has engaged for disposing of all unwanted cadavers. He does not have a boss who writes his appraisal, giving him constructive feedback for continuous improvement. In most work environments, people who produce anything of economic value usually need supervision. A person who needs supervision is no professional. He is an amateur, maybe even an apprentice. Thought provoking, isn’t it? What do you think? 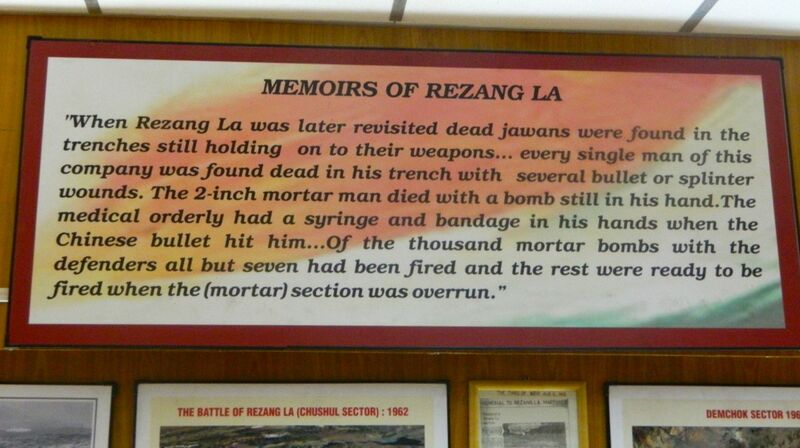 For the beginners, battle of Rezang La is arguably the most revered one in the glorious history of the Indian Army. It was a day when ‘a Rajput led a battalion of Ahirs’ and led them so bravely against the might Chinese in the 1962 Indo-China war. 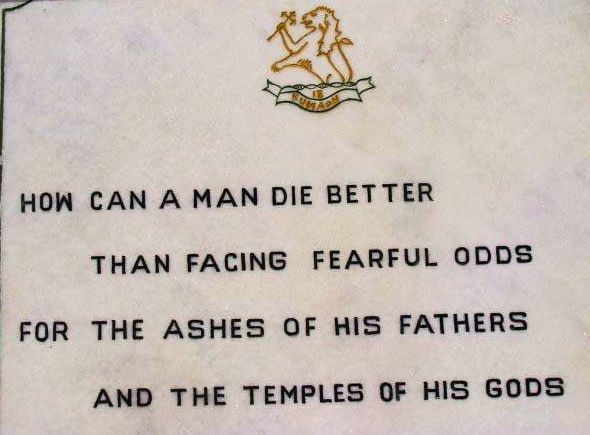 18 November 1962 – this date saw Indian Davids – 3 JCOs and 124 other ranks of the C Company of 13 Kumaon, led by Major Shaitan Singh fight the Chinese Goliath. And history has it; they fought the enemy with valour unparalleled. Only 14 survived, and by the official statistics, they killed over 1700 of the Chinese soldiers! So many bodies, that Chinese were required to fetch 25 trucks to take back their dead! And you must know, these warriors fought here without the support of artillery – such was the location. For this bravery, 13 Kumaon was conferred with several medals – Maj. Shaitan Singh was posthumously conferred the Param Vir Chakra. Eight more received the Vir Chakra while four others the Sena Medal. 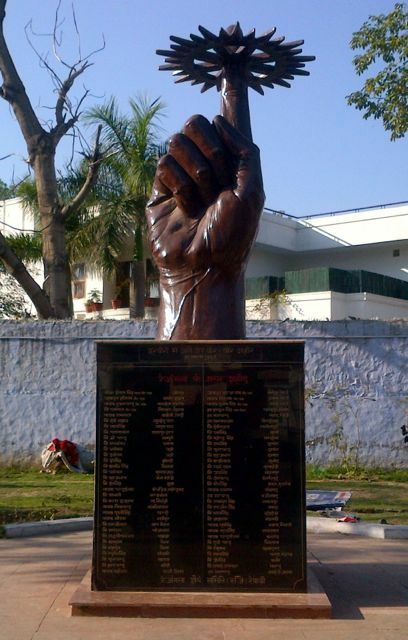 Unlike one to Ladakh, ride to the Memorial at Rewari is very easy. 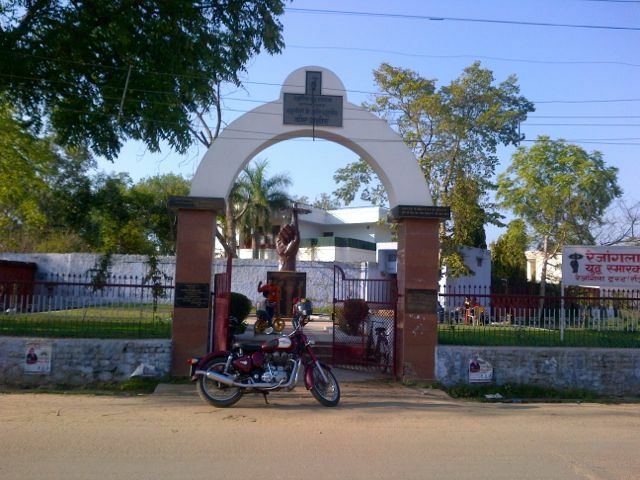 This memorial is housed in a small compound located on the main road, close to the Bus Stand of the town. 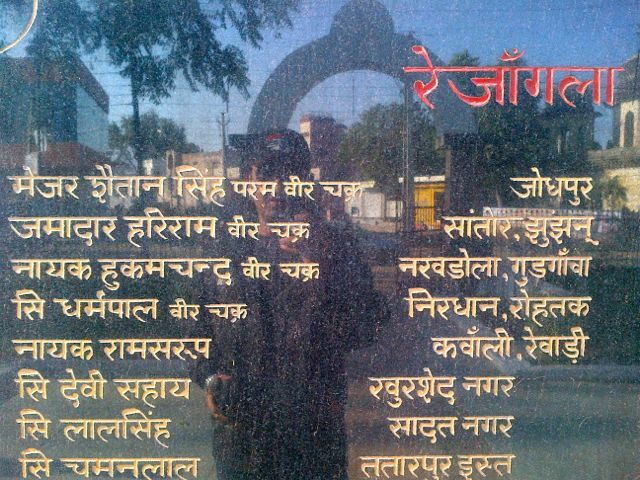 This Memorial at Rewari was constructed by the Rezangla Shaurya Samiti. 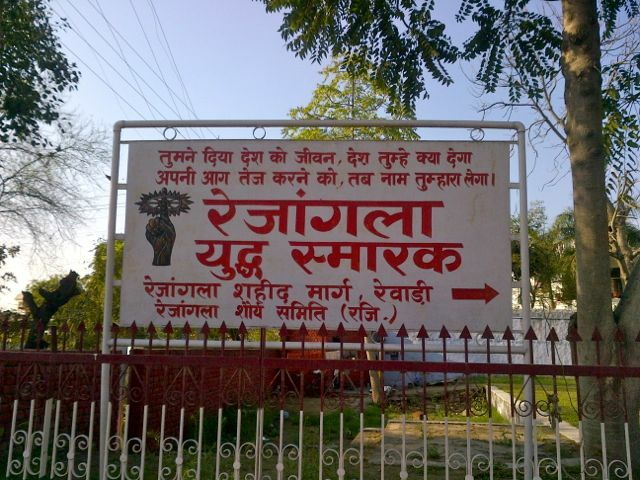 Locals I spoke with shared that memorial functions are held annually by the Samiti in collaboration with local administration and the Kumaon Regiment. These events are also attended by the family members of the martyred soldiers. इस एक बयान से इस सेल्समेन ने आधुनिक ब्रिटेन को अपने काले साम्राज्यवादी इतिहास से अलग कर लेने की जो कोशिश की, वो खुद में शर्मनाक है। इसलिए नहीं की जो कहा वो गलत है, पर इसलिए की जिस मतलबीपने से, जिस लोभ से कहा, वो ज़रूर निन्दंनीय है। आप खुद ही देखिये कि ब्रिटेन के गार्जियन समाचार पत्र ने क्या बढ़िया कटोरा पकड़ाया अपने प्रधानमंत्री रूपी सेल्समेन को, इस शोचनीय कोशिश के बाद! अभी तक सुना नहीं की मनमोहन साहब ने क्या कहा इस बारे में। बहुत संभव है की कुछ भी ना बोला हो, और आगे भी न बोलें; वो वैसे भी चुप रहने में ही यकीन रखते हैं! आप क्या सोचते हैं, बताईयेगा? क्यों, सही बात है ना? Your Leadership. What is in it for me? Just heard the magnetic speech of Narendra Modi, who was speaking from the dais of the renowned Shri Ram College of College, University of Delhi. As the chief guest of the Business Enclave 2013 hosted by the college, he was delivering the Shri Ram Memorial Lecture of the year. He spoke at length about several initiatives that have led to the all-pervasive growth of the Indian state of Gujarat for over a decade or so. However, I am not writing to praise Modi or the work his government has accomplished in Gujarat. That’s not what made me tune in to his speech in the first place. Rather what made me listen to his speech with attention was my keen desire to observe and note his leadership & influencing skills, a key area of my focus and learning. And I am so impressed! Not because he spoke so well, Indian polity is replete with many eloquent orators across party lines. Not because he spoke of facts and figures of development, I know speechwriters are good at that. 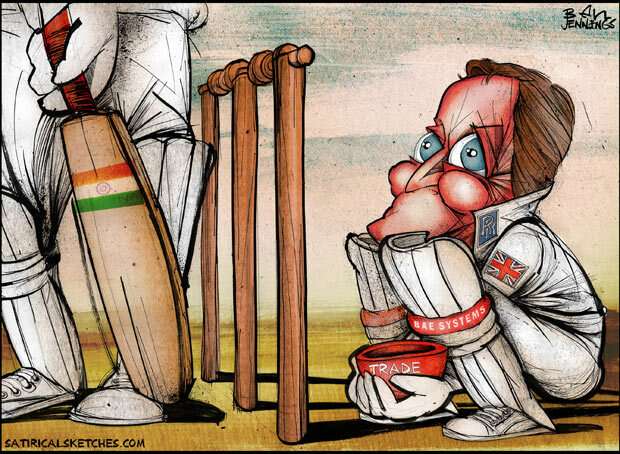 Not because his model of development is catching the eyes of the world, and certainly not because of the running debate of whether or not he should be or would be the next Prime Minister of the nation. Often I have pondered as to why the leaders of the present times don’t sound authentic and appear compelling to me and not only to me, they don’t appear compelling to the entire youth. I ask, why is this missing in the present Prime Minister, who has the distinction of being the most celebrated economist? Certainly not the competence or the character, the twin bedrock of leadership; those we know he has, aplenty. Then what’s missing in his words, and in most of most of leaders we meet and see around us? What is missing in most of the leaders of the political class, and otherwise, is what I call the soul of a leader. They don’t answer as to why should I feel connected, why should I feel belonged and what is in for me in all they are saying and envisioning. Narendra Modi was inspiring – he appeared bold and forthcoming in his speech and demeanor. He was also relevant – made me as a listener quickly calculate the leader’s capability, basis the proven track record of his competence. I won’t say I got sold, but he did get my serious attention over his offer of providing me with a win-win proposition, a victory for him a leader and for me as a follower. In my earlier blog on a leader’s authenticity and trustworthiness, I wrote at length about the importance of connect of a follower with his leader. Modi proves my point today. I am not sure how many of you would agree with me, but if the reaction of the youth brigade present at the event was to be kept in mind, they proved with their attention and applause that even they felt belonged. India; the youngest nation of the world. A nation, which is in dire need of and search for visionary leadership, not only in governance, but also across industry, education and other sectors. A nation of all brilliance and capability that one can put on offer. A nation with growing knowledge-workers and rising aspirations. Quite like a corporate organization brimming with talent across levels, waiting to deliver superior results, only when guided and led by a true leader. This talent would look for leaders not only worthy & competent to lead them, but also who appear keen and enthusiastic to do so. And don’t mistake this talent as one merely looking for and getting sold to the word-weavers and eloquent seller of dreams. This talent is smart and calculative enough to measure the reality and then invest their faith in the leadership. This talent will carefully watch out for their leader’s passion and commitment; they will be unrelenting in pursuit of leader’s sincerity of purpose and would demand to know whether the leader would take them towards an environment where they can deliver their best. And they would keenly watch for the growth and success that gets offered on the cards, should they commit their faith and hard work to the vision of such a leader. Thus, mere oratory won’t work. I am no fan of Modi, and this isn’t a political critique I am writing. I also do not have any good view of the hardliner politics he has been accused of practicing and rather have a dislike for it. I haven’t even started thinking to become a follower of his. The jury may be still out on his capabilities as an administrator and I am sure the opposition leaders will be vying for his blood after today’s speech. Yet, what he did convincingly today was to sound honest and meaningful as a leader to me – a commoner. Something that most leaders, across domains, fail miserably at. Disclaimer: The views expressed in this blog are author’s own and not of the organization he is associated with. Are You An Authentic Leader? Often in the corporate world’s setting around us, we hear the magic word, ‘trust’. There isn’t any dearth of literature on this subject, especially when it comes to importance of ‘trust’ in relationships at work; more so, in the manager-subordinate relationship. ‘Trust me, please’ is writ large over every leader’s forehead; you must have observed nearly every leader wanting to secure his team’s trust; so much so, that we HR folks often end up conducting developmental workshops, engagement surveys and what not more around this area of organizational effectiveness. I agree that trust can be easily termed as one of the most important pillars of organizational effectiveness. However, to my mind, there is an even more crucial aspect to work-relationships – authenticity. Being trustworthy and being authentic are often confused as the same attribute. It isn’t so, in my opinion; they are two distinct behavioural attributes that impact anyone’s leadership quotient. While everyone loves the idea of a ‘trustworthy’ leader – both leaders and followers share equal appeal for it, very few appreciate the need of genuine leadership traits – ones that begin foremost from every leader knowing and acting ‘true self’, reflecting one’s true personality and thought process in everyday actions. What organizations need and what followers look for are authentic leaders who are themselves aware of who they are, what is their vision for the organization and how to make followers relate to them so as to help them transform their vision a reality. Over last couple of years, I have extensively researched about what is authenticity and how this attribute plays a pivotal role amongst other leadership traits. In my last year’s blog of the ‘Leadership’ series, ‘Why Should Anyone Be Led By You’, one of the 12 questions that I asked the leadership aspirants was – ‘Am I an authentic person and appear one too?’ Having spent some good time exploring this closely, putting the learning to test and subsequently experiencing the results it brings, I have come to a conclusion that this is the most primary trait of leadership. Laying down the ‘necessary’ nine skills required for the practice of great leadership’ in his outstandingly simple and practical work, ‘Unusually Excellent’, John Hamm speaks at length about the credibility and character as a primary leadership imperative. He further splits credibility into following three dimensions – a leader being compelling, authentic and trustworthy. A leader needs to not only know his own self, but also listen to self. His experiences, value-system, how he sees the world, how he sees other people, his feelings & habits, aspirations, all count big when it comes to leading others. They all form an integral whole when it comes to shaping the character of a leader, and we all know, character of a leader makes or breaks the followers’ faith and inspiration in him. So true this sounds, specially when we see a lot of ‘leaders’ trying too hard to earn the trust of their teams, without actually giving any opportunity whatsoever to let people know what really drives & motivates them, what are their passions, and even sharing their failures – areas where they failed and that it is indeed OK to fail. In short, I have seen most leaders trying to appear ‘perfect’! Now, if that is the case and if that’s the perception they wish to build, how would they ever receive any feedback from their followers? Feedback comes when people relate to you, not when they see you seeing yourself, portraying yourself as perfect. Specially your followers, who wouldn’t just risk it. Think of it; if your followers wouldn’t know how ‘authentically’ you take your failures, would they ever share theirs’ with you or tell you your own grey areas? Chances are rare, I would say. “Unusually Excellent leaders find the courage within to be authentic- and that takes knowing themselves, accepting the disappointment of their past, and actively seeking feedback form their teams. If your own image is a portrayal of ‘perfectness personified’, and your followers see you trying to keep it that way, I am convinced feedback isn’t going to come your way. And deep down our hearts, we know that can be ‘Hara-kiri’ of sorts in the pursuit of leadership. It is this willingness and pledge to authenticity that is the bedrock of becoming trustworthy. Authenticity is a primary skill, even before a leader moves on to establish his trustworthiness. Once we are accepted as ‘genuinely authentic’, then only our followers shall accept our equity as a leader. In my view, by saying so the authors dispel the fear that leaders need to be a different ‘person’ in different situations; they rather display their true self in all situations and only ‘act’ differently as per the merits of the situation. That would go far in securing trust and gaining confidence of their followers that to keep them guessing. “Can people trust you?” asks Linda Hill, the Wallace Bret Donham Professor of Business Administration at Harvard Business School. She chairs the HBS Leadership Initiative; and poses this question in her widely acclaimed book, ‘Being The Boss’. When I read this gem of a book few years ago, this one question stayed with me and it has been instrumental in shaping my thought process on ‘why would people trust me in first place if they don’t know me? To my mind, this ‘Why’ is primary and fundamental over the ‘Can’ part. “The quality of work they (followers) do, the care and commitment they devote, their willingness to expend extra effort, all depend in significant part on the kind of person you are. My message – don’t be a copycat leader; be you. It works better. Tagged with Are you being authentic?, Authentic Leadership, Authenticity & Trust, Being The Boss, HR Blogs, Human Resources, John Hamm, Knowing Self, Leadership, Leading a Team, Linda Hill, People Leadership, Rishi Raj Gupta, Unusually Excellent, Why should anyone be led by you?